When doctors check reflexes, they don’t always get a normal response. 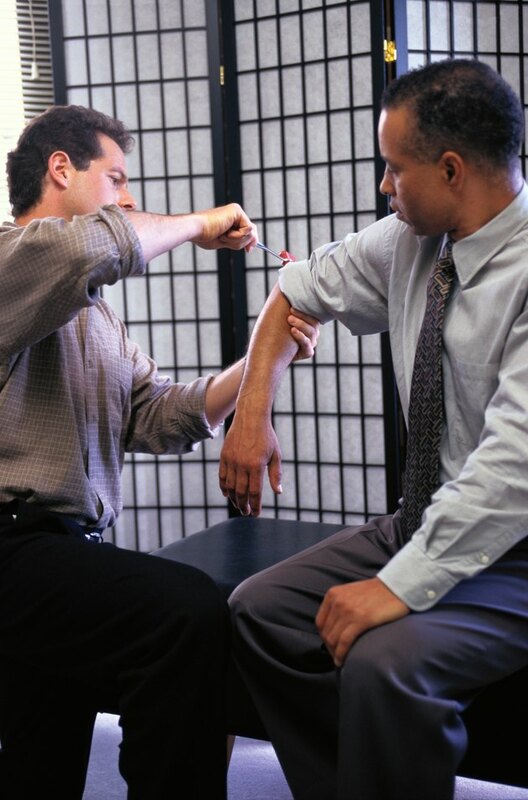 Clonus, a type of hyperactive reflex, is a rhythmic response to reflex testing. Instead of just one movement, a series of repetitive reflex movements are observed. Clonus reveals a problem with the nerve cells in the brain that control movement, or the wires that they send down through the spinal cord. Damage to these brain cells or their wires allows nerve cells in the spinal cord to activate muscles excessively. This causes hyperactive reflexes and clonus. Common causes of clonus are multiple sclerosis, strokes, tumors and trauma. Multiple sclerosis is the most common cause of nervous system-related disability in young adults, according to a May 2013 “American Family Physician” article. With MS, the immune system mistakenly attacks and destroys the insulating material around nerves that enables fast transmission of nerve signals. The loss of this material -- a process called demyelination -- disrupts nerve signals between the brain and spinal cord, leading to clonus. Depending on the sites of demyelination, clonus can affect different areas and be present on one or both sides of the body. Strokes occur when brain cells do not receive enough oxygen or nutrients due to blockage of a blood vessel by a clot, or due to bleeding in the brain. Clonus develops after a stroke if it injures the brain's motor nerve cells -- cells that control body movements -- or their wires as they descend toward the spinal cord. Similarly, brain tumors that are located near the brain's motor nerve cells or wires, or cause swelling in these areas, can cause clonus. In both of these cases, a stroke or tumor on one side of the brain will cause weakness and clonus on the opposite side of the body. Trauma that causes a torn, or severed, spinal cord ultimately results in clonus. This is because the motor nerve cells in the spinal cord below the level of the injury no longer receive any signals from above to inhibit their activity. Head trauma can also cause clonus, through direct injury to motor nerve cells in the cerebral cortex -- the outer portion of the brain -- or through shear forces that injure the wires. Infections like meningitis -- involving the membranes that surround the brain -- or encephalitis -- involving the brain itself -- cause clonus through direct injury of nerve cells or their wires, or through brain swelling. Clonus is one of the features used to diagnose serotonin syndrome, a condition resulting from an excess of the nervous system chemical serotonin. Serotonin syndrome is usually caused by high doses or combinations of certain prescription medications, though it can also be caused by drugs of abuse. Other symptoms of this syndrome include agitation, confusion, fever, diarrhea, tremor, sweating, shivering, muscle breakdown, seizures and -- when severe -- multi-organ failure. There are many less common causes of clonus, since clonus can result from any condition affecting the brain cells that control movement or the wires they send through the spinal cord. Examples are Lou Gehrig disease, hereditary spastic paraparesis and anoxic brain injury, caused by inadequate oxygen supply to the brain. Disorders of the Nervous System: A Primer; Alexander G. Reeves, M.D. and Rand S. Swenson, M.D, Ph.D.
Neurology in Clinical Practice: The Neurological Disorders, Vol. 2, 4th ed. ; Walter George Bradley et al., ed.